We have come to Strasbourg for a long weekend, determined to get ourselves in a real holiday mood with whatever this French city on the German border has to offer: cold weather, festive decorations, charming architecture. I have been told -- by a Frenchwoman no less -- to make sure to try Strasbourg's delicious foods, which are Germanic, but improved by being Frenchified and more refined. That is like saying Arnold Schwarzenegger would be a great ballerina if only you put him in a tutu. So let's call a spade a spade: it's German food. The jarret de porc, or pork knuckles, are my "best" local meal in Strasbourg. We try the flamenkuche -- known here also as tarte flambée, and in English as flatbreads with cream and toppings. There is no other way to describe this other than to say that it is Germanic pizza, and that there is a reason there's no such thing as a German pizza parlor in the U.S.. You know that expression that even bad pizza is good pizza? Well, when even 6 and 8 year-old American children refuse to order it any more, you know that, in fact, this pizza is so bad, it's bad. Anthony tries the choucroute topped with its many boiled pink sausage meats, which he likes well enough, despite the "yuck" faces I am making. Choucroute means sauerkraut, and it is fine and tangy -- at least you would expect them to get that right here -- but I think the boiled meats are (avert your eyes, bad pun coming) the wurst. On the streets, the pretzels are soft, but served cold and without mustard (Why? What did I ever do to you, Strasbourg?!). There are at least twenty varieties of bredele, cute button-sized Christmas cookies in a variety of shapes. The stars taste just like the crescents which taste just like the bells which taste just like airplane food cookies. The only exception is the bredele we find that is flavored with geranium, which tastes -- according to Anthony -- like dishwashing liquid. I almost liked that one: At least it had flavor. 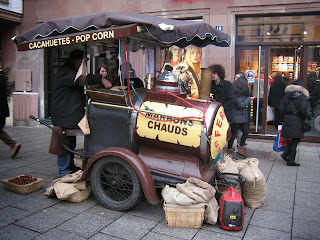 I do like the roasted chestnuts being sold around town from train-shaped stands: hot, slightly burned, and great hand-warmers in their paper bags. The biggest hit, for myself and Anthony at least, however, is the glühwein -- hot mulled wine -- along with the utter lack of open container laws. The entire town is walking along blissfully warming themselves up with hot spiced wine. So much of the alcohol has burned off that even I am capable of downing a whole coffee-to-go-sized cup of it. Both red and white. Perfect for the winter weather. When indoors and not presented with glühwein, Anthony makes do quite happily with a big almost-Germanic beer. No complaints there. Ironically, never in my life have I been someplace where it is so hard to get a table in a restaurant. We are turned down from nearly ten restaurants over the course of an hour wandering around town on a Sunday night, no less. This is, by all appearances, the place to be for the holidays. Go to Strasbourg for the Christmas markets. Go to Strasbourg for the colorful buildings. Go for the cobbled streets and storybook lanes. Go for the glühwein and beer. Go for the wonderful German-influenced Alsatian culture. But Gott in Himmel, just don't go for the food. 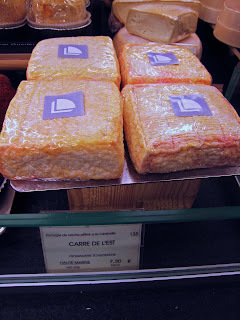 Carré de l'Est, which means "Square of the East," is a pasteurized cow cheese that comes from the Alsace region and its immediate surroundings. 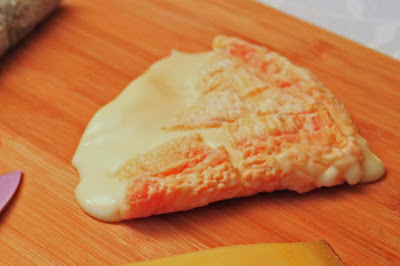 It's a soft cheese, especially at room temperature, but perhaps that goes without saying as it creeps, amoeba-like, all over the cheese platter in the photo below. This particular one comes from a cheese producer named Schertenleib in the Haut-Marne, a few hours drive west of Strasbourg. This would have been a better connection if it were called the Pretzel of the East, but I guess it's hard to form cheeses like that [note to creative cheesemakers: But if you could, they would sell like hotcakes. Or at least like hot pretzels]. Carré de l'Est comes from this eastern part of France, in Alsace and the areas surrounding Strasbourg. To my palate, it's a heck of a lot better than the rest of the regional food.